In late 2006, when I asked my mentor what I needed to do to get up to speed quickly on SharePoint for my first major SharePoint project, he had great advice that I only followed reluctantly. The mentor was Matthew McDermott. He told me to read more than 1000 pages of free documentation from Microsoft. And he told me to practice it and then re-read it and only then I would know the basics. At the time, it sounded crazy to me as an additional workload to my current projects. Only because I trusted Matt, believed in Microsoft’s new vision for the as of yet unreleased SharePoint 2007 at the time and wanted to deliver a quality first SharePoint project that I took his advice. And I couldn’t be happier that I made that leap. Combined with the advice and mentorship of another great consultant, Tom Stewart, I was ready for learning what I needed to lead a project on this new platform. With Tom, I had already gained experience on Microsoft Content Management Server. I had become comfortable with the Content Management concept of page layouts and publishing pages that applied in SharePoint with the 2007 release. I also had worked on SharePoint web parts before. But I hadn’t really grasped the power of the platform before I set off to really understand how it is installed and configured. What follows is my advice for new SharePoint installers based on the advice I received when I was new. I’ve updated it to SharePoint 2010, but keep in mind there have already been multiple releases of the books below during the current product’s life and there may be more. There is so much Downloadable book content for SharePoint Server 2010 now compared to before. I noticed they even have many of the downloadable books for sale on Amazon now, which isn’t a bad option. I normally print some of the books out, but it is a lot of pages. It might cost as much in ink and paper as the cost to buy it preprinted and bound on Amazon. Of those, I generally recommend reading the two planning guides cover to cover, about 800 pages and the deployment guide, another 380 pages. 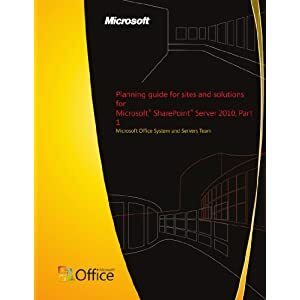 For a first time install of SharePoint, I recommend printing out the deployment guide and following it step by step, making notes on the pages where you might make changes in a future installation. After installing and configuring SharePoint a few times using the deployment guide and after reading the planning guide, you should have a good grasp on most of the backend features of SharePoint. You might even be ready to pass a Microsoft Certification for IT Pros. Whether your goal is to move more into the administrator or developer side of SharePoint, following the steps above is a good start. The IT Professional side of SharePoint deals with server installs, configuration and maintenance. The Developer side of SharePoint involves writing custom solutions that are deployed to a SharePoint Server. However, as a SharePoint Developer, you often are best served by installing and configuring your own development environment to mirror the production server. The better you grasp the concepts introduced in the above books, the better you will be able to control the fate of your development server. This is a great post, Tom. Thanks for putting this up! Thanks so much for reading and commenting. I’m glad you liked it! Great Post! I’m glad there is so much information out there for everyone in the SharePoint Community. Thanks for reading and commenting! There is a lot of quality information. Tom, thanks so much for this post! I thought I had read all the online Microsoft articles about SP2010 but had never seen these guides. About to start downloading right now! Thanks for reading! Enjoy the guides. They are comprehensive.